Sometimes you need the past to change the future. The book opens with a grumpy Olivia Holmes hating the idea of a get-together organised by her company, as a team-building exercise. A typical city-girl, spending her day in the wilds, rather than the comforts of her home was the last thing she wanted to do. Amidst all this, a call from a law firm keeps bugging her and when finally she gets it, it changes her life for good, or does it? The title intrigued me as something of a laughter riot, all mixed up and something, hilarious situations, things like that, though it is more of a feel-good book. Apart from that, a really nice looking cover adds to its overall aesthetics. 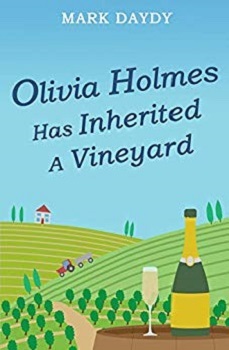 As the title suggests, the book revolves around Olivia or “Liv” as her friends call her, inheriting a vineyard, just like that. However, any inheritance comes with its own price, and conditions, and this one does too. The book follows Olivia’s and others journey, as the characters struggle to keep life together, both at personal and professional front. Running a vineyard is no joke, and coupled with the mysterious life of the ex-owner, it keeps the readers hooked. How to run the business, how to make relations work and how to sort life out are some of the things the characters try to find an answer to, in the meanwhile trying to build an identity, which see-saws between a city and a countryside one. Mark Daydy has done a wonderful job in narration, the detailing is so vivid, I felt like it was happening in front of my eyes. Small things are the way to go! The storyline is very smooth, though sometimes, you can struggle to keep up with some of the technicalities associated with wine-making, good detailing, yes, but then again, something which I felt. Sheer determination of the characters is one of the highlights of this book. It gives you food for thought and coupled with the feel-good factor, it makes for a good read. The climax is satisfying and the book finishes on a high. Over the past 20 years, I’ve written extensively for TV and radio in the UK and I’m currently developing a TV sitcom (optioned by NBC-Universal). I love reading heart-warming, humorous novels about life’s little ups and downs, so it’s hardly a shock that I’ve started writing them myself. In my stories, I look to bring the feel-good factor (laughter and, perhaps, a few tears) to romance and relationships, changing careers, moving home, family upheaval, growing up, and a whole host of other bumps in the road. If you’re a fan of Nick Spalding, David Nicholls, Jon Rance, Mike Gayle, Matt Dunn and Nick Hornby, your horoscope says it’s a very good time to buy my books.